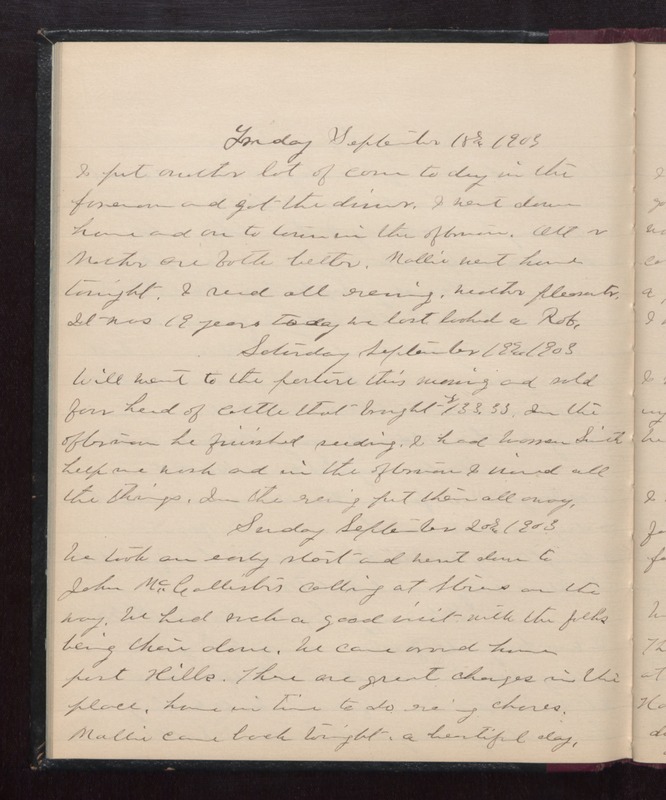 Friday September 18th 1903 I put another lot of corn to dry in the forenoon and got the dinner. I went down home and on to town in the afternoon. Ott & Mother are both better. Mollie went hone tonight. I read all evening. weather pleasanter. It was 19 years today we last looked at Rob. Saturday September 19th 1903 Will went to the pasture this morning and sold four head of cattle that brought $133.33. In the afternoon he finished seeding. I had Warren Smith help me wash and in the afternoon I ironed all the things. In the evening put them all away. Sunday September 20th 1903 We took an early start and went down to John McCallister's called at Stevens on the way. We had such a good visit with the folks being their done. We came around home past Hills. There are great changes in the place. Home in time to do evening chores. Mollie came back tonight. a beautiful day.